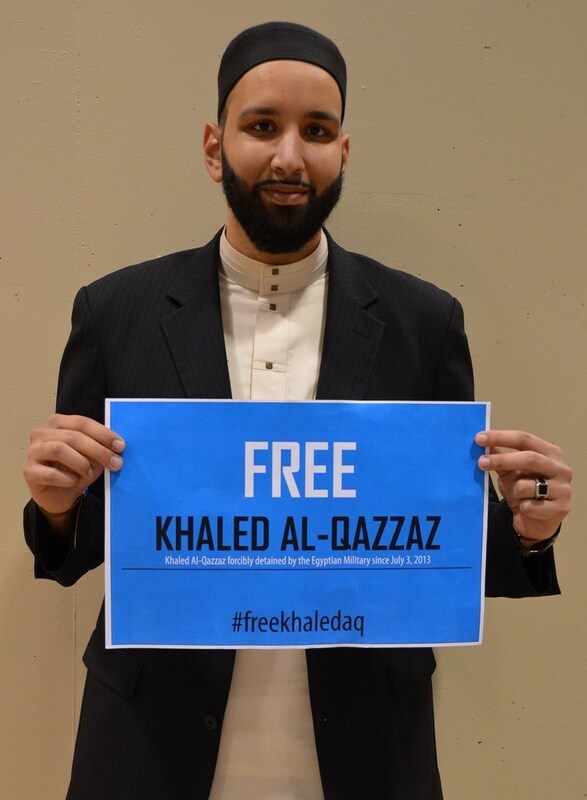 The Free Khaled Al-Qazzaz campaign has received support from public figures across the world. Amnesty International has released multiple statements and calls to action highlighting the injustice that Khaled is facing. As part of the Pay-it-Froward campaign, Alex Neve, Secretary General of Amnesty International Canada (English branch), has donated to the Canadian Centre for International Justice, in honor of Khaled’s commitment to social justice. Human Rights Watch recognizes that Khaled Al-Qazzaz’s detainment is a breach of human rights. Sarah Leah Whitson, the Executive Director of the Middle East and North Africa Division of Human Rights Watch joined the pay-it-forward campaign. She announced on Twitter: “To mark over 500 days of Khaled’s unjust imprisonment without charge in Egypt, I’m paying it forward by making a donation to New York City’s public schools, in honor of Khaled’s commitment to education for all”. Erna Paris, acclaimed Canadian non-fiction author and winner of twelve national and international writing awards, joins the #PayitForward4KQ initiative, making a donation on Khaled's behalf to the World Federalist Movement - Canada. WFM is a global citizens movement dedicated to promoting institutions of world governance. "I support the human rights of Khaled who has been unjustly imprisoned in Egypt. He should be brought home and reunited with his wife and four children and I call on the Canadian government to urgently secure his immediate release." Dr. Tariq Ramadan is Swiss academic and writer and Professor of Contemporary Islamic Studies in the Faculty of Oriental Studies at Oxford University. He was named by Foreign Policy magazine on its list of 100 top global thinkers in 2008, 2009, 2010 and 2012. Dr. Ramadan has spoken publicly about the injustice Khaled, and others like him, are facing. Margaret Eleanor Atwood, acclaimed Canadian poet, novelist, literary critic, essayist, and environmental activist, signed an Open Letter to the Right Honourable Stephen Harper, calling on him to use the full power of his office to demand the immediate release of Khaled Al-Qazzaz. Dr. John Greyson is a Canadian filmmaker, writer, activist and professor at York University, where he teaches film and video theory. In summer 2013, John traveled to Egypt, where he and fellow Canadian, Tarek Loubani, were detained without charges. They remained in detention from August 16 to October 5, 2013. John Greyson stands with Sarah Attia in her struggle to bring Khaled home. Dr. John Esposito, American professor of International Affairs and Islamic Studies at Georgetown University in Washington, D.C, and director of the Prince Alwaleed Center for Muslim–Christian Understanding at Georgetown, is a Free Khaled supporter. He contributed to the #PayitForward4KQ initiative by making a donation on Khaled's behalf to Amnesty International, Human Rights Watch and Southern Poverty Law Center. Dr. Monia Mazigh, Canadian author, politician, academic and activist, is a supporter of the Free Khaled campaign. On numerous occasions she has shared her own experiences efforts to free her husband, Maher Arar, from a Syrian prison where he was illegally detained, with Sarah Attia on numerous occasions. “I'm inspired and amazed by the generous spirit of those around me. This month, Sarah Attia started the #PayitForward4KQ campaign, encouraging acts of kindness in honour of her husband, Canadian Khaled Al-Qazzaz, who has been held in detention in Egypt for over 500 days without charges or due process. 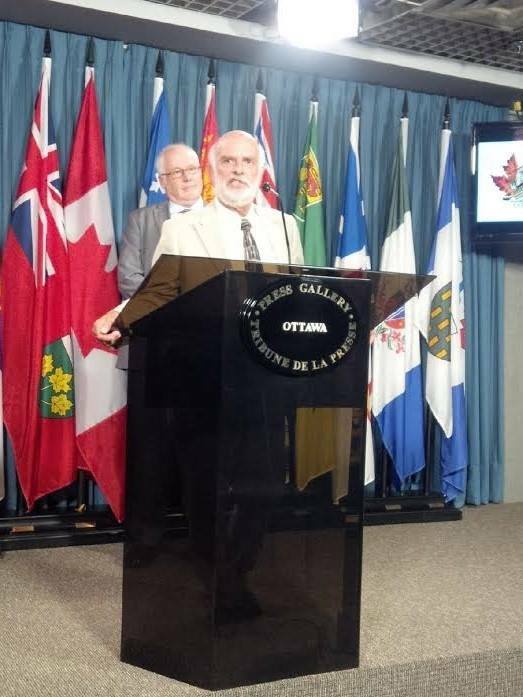 Roch Tasse, National Coordinator of the International Civil Liberties Monitoring Group hosted a Parliament Hill Press Conference on July 15, 2014. The press conference highlighted the Open Letter to PM Stephen Harper which was endorsed by leading Canadians committed to Khaled’s release. Medea Benjamin is the Cofounder of Global Exchange and peace group CODEPINK. On July 3, 2014, CODEPINK wrote a letter to General Abdel Fattah el-Sisi calling on Khaled’s release. The letter states: "In order to uphold standards of human rights, civil liberties, and respect for human dignity, CODEPINK urges the immediate and safe release of prisoner Al-Qazzaz to mark the beginning of turning tides of respect for human rights in Egypt." Dalia Mogahed is Chairman and CEO of Mogahed Consulting, specializing in Muslim societies and the Middle East. She is former Executive Director of and Senior Analyst for the Gallup Center for Muslim Studies and is coauthor of the book (with John Esposito) "Who Speaks for Islam? : What a Billion Muslims Really Think." Imam Zaid Shakir is co-founder, board member, and senior faculty member of Zaytuna College in Berkeley, CA. 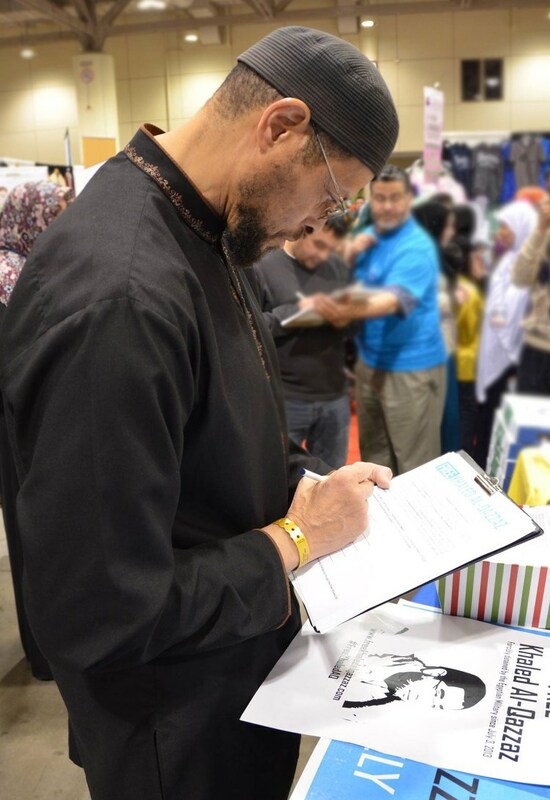 Suhaib Webb is a contemporary American-Muslim educator, activist and lecturer. He is Founder and Instructor at Ella Collins Institute in Boston and Imam of the Islamic Society of Boston Cultural Center (ISBCC). Yasmin Mogahed is a writer for the Huffington Post is and an internationally published author of 'Reclaim Your Heart,' a book on spiritual and personal development. Nouman Ali Khan is the founder and CEO of Bayyinah Institute and Bayyinah TV. He was listed as one of the most influential young western Muslim scholars in the fifth edition of The 500 Most Influential Muslims.